Jenson Button says he was pleased with a podium result in his full-season Super GT debut, following an up-and-down opening round in Okayama. 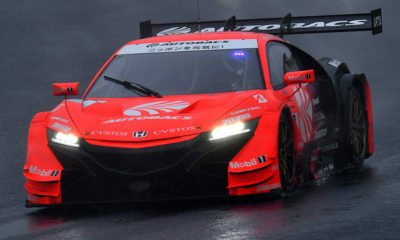 The 2009 Formula 1 World Champion and co-driver Naoki Yamamoto took their Raybrig Honda NSX-GT to a runner-up finish, behind the race-winning Keihin Honda of Koudai Tsukakoshi and Takashi Kogure, thanks to a strategic call to double stint tires on their pit stop. Button, who started from fifth on the grid, lost ground in the early stages of the 500km race but became the beneficiary of multiple penalties for cars jumping the start. “We couldn’t overtake before the light but a lot of cars went past before the start,” he explained. “The No. 2 Nissan, No. 23 and No. 24, so that’s why they [all] got penalties. “I was then trying to pass No. 8, and another car was able to go past me. Penalties for the Nissans promoted him to 7th, although the car briefly took over the lead, in the hands of co-driver Yamamoto, due to the team’s call from the pit box. “I knew our strategy was going to be interesting,” Button said. “I lost 19 seconds to No. 17 before the pit stop. We knew that we’d make up 20-25 seconds with our strategy, but with old tires, it was very difficult to prevent No. 17 from overtaking. “He tried really hard and made a great race but the No. 17 was [much better] on new tires. Remarkably, it was Button’s first podium finish since his victory in the 2012 Brazilian Grand Prix, in what the Englishman described as a “very special” moment, as he still comes to grips with the Japan-based sports car championship. “This was my first race in Super GT as a regular driver,” he said. “It doesn’t matter how many years you’ve raced in Formula 1. You gain experience but you also have to learn so much. The 1-2 result for Honda has also put the Japanese manufacturer out front of the championship, heading into next month’s round in Fuji. “I think it’s the best start for Honda in many years at Okayama International Circuit,” Button said. “It’s not a circuit that really suits the Honda normally and Fuji is also a difficult circuit. But in the test, our car was [not very] quick, so with the 30kg weight penalty, it will make more difficult.